Efe Ambrose was most recently with Hibs in Scotland. Efe Ambrose could be about to sign for Derby County having been training with the Rams in recent weeks. Nigerian Ambrose, 30, is a free agent having opted to leave SPL side Hibernian last month despite being offered a new deal to remain in Edinburgh. Ambrose previously spent five years with Celtic, where he played frequently in the Champions League, and also has experience playing in his home country and in Israel, as well as having 54 international caps to his name. Being a free agent, he can sign for Derby outside of the transfer window. 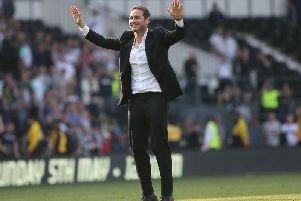 And speaking after Saturday's 2-0 win over Hull City, Rams boss Frank Lampard said: "We are talking, he is training with us. It is not done yet, it could be done soon."